Want new furniture? 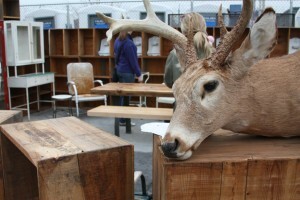 Or a deer head for your mantle? Find it at one of the flea markets in Williamsburg. Ask anyone, even Brian Williams, and they’ll tell you Williamsburg is home of the flea market. But the markets here aren’t your grandma’s flea markets. You won’t find that old bowling trophy or those 99-cent flip-flops. Unless there’s some sort of irony involved. Since 2003, the Burg’s had Artists and Fleas, an artisan market that celebrates vintage clothes, homemade jewelry and gourmet-style street food. Amy Abrams & Ronen Glimer started the market as a way to promote small business in the community. “We’ve had so many of our vendors quit their day jobs because they really can support themselves on the market,” Abrams said. There are eight stores in the neighborhood including Brooklyn Charm and The Mast Brothers Chocolate that have opened as a result of the money they earned as a vendor at the flea market. For years Artists and Fleas had a stronghold on the area, but now it’s got a little competition in way of The Brooklyn Flea, the market the New York Times called, “One of the great urban experiences in New York.” The Flea now bides its time between Fort Greene (its original home) and Williamsburg. With 150 vendors each week, The Brooklyn Flea packs a big punch. Many feel the Brooklyn Flea is expensive, but co-founder Eric Dembey says you are paying for specialty items. “The vendors really subsist on those really regular buyers and designers that go to source high priced items. That’s what really keeps those people successful and in business,” he says. From refurbished typewriters to reworked vintage furniture, this is where shoppers go for that one of a kind piece. When talking with Demby he showed little concerned about being the new kid on the block, but says there is always competition when it comes to business. The first weekend marked big crowds for both fleas, but there’s still the question if the hipster mecca really needs two markets. Especially two that seem to be catering to the same market. With Artists and Fleas located in a new warehouse on North 7th Street and The Brooklyn Flea down the block by the waterfront you have to wonder if will the two thrive or if their sameness will dilute the market. What do you think? This entry was posted in Culture, Fashion, Food and tagged Artists and Fleas, brooklyn, The Brooklyn Flea, Williamsburg. Bookmark the permalink.